Being a follower has such a negative connotation behind in sometimes. This question is one that would be answered based on what the circumstances are. I could absolutely be a leader in some situations but sometimes I choose not to be. I choose not to be because sometimes I enjoy stepping back and observing. Leadership tends to come with a lot of pressure and stress…which is sometimes unnecessary. Now don’t get me wrong, there are situations in which I would love to be a leader and believe I could be a strong one. When it comes to humanitarian causes, I could be an extremely strong leader because I do not see leadership as a position of power. A leader is someone there to guide the group…not dictate and bark at (at least that is the way I see it…unfortunately many leaders do not see it the same way). I sometimes think I see the world through rose-colored glasses and what some would say through naïve eyes. I believe in coming together and working together as a whole…focusing on trying to embrace differences instead of pointing them out and dislking (or worse hating) each other because of them. I love that I am that way though because honestly (without tooting my own horn) I believe it naturally draws people to me. People can sense warmth from me because of my accepting nature and I strive to make people feel welcome and comfortable in as many settings as possible….it is not always an easy thing and sometimes I am rejected but I always make it a point to try. I believe this is what a leader is and should be. A leader does not need to run or Fortune 500 company or hell even run a country…leaders are everywhere in the world….and many don’t strive for recognition. With this being said, I believe we are all followers as well. We all are introduced to different trends daily in society and we will always choose to follow one or another…whether it be fashion trends, media trends or political trends. We hear the opinions of others and we follow those same beliefs because it feels right to us. Why is that a bad thing? I guess it could be if you are abandoning your beliefs just to please others but if you are introduced to something and you naturally are drawn to it then you follow it…that does not seem like a bad thing to me….that tells me that you are being true to self. I guess what kind of bothers me sometimes if the negative connotations that come behind some of the ways people are perceived. We read so much about Being a Leader not a Follower. Some people are just not natural leaders and that should not be found as a bad thing. I have strengths and I have weaknesses just like everyone else and if I do not feel comfortable taking on a leadership position because I don’t believe I could do it justice then I don’t believe I should receive criticism over that…nor should anyone else. Variety of personalities is what makes this world so interesting and I guess (as of lately) it just kind of gets under my skin how quickly we are able to point out what people are doing wrong over what they are doing right. Why can’t we see those unique qualities as special instead of “weird” or “quirky”. I believe that so many of these quiet loners snap because society beats them down so much for not fitting into the “norm”. What is the norm exactly??? Why is being one way better than another? I am not condoning their behaviors by any means…I am just saying that sometimes I understand the internal struggle of trying to fit into societal norms. Some people are unable to handle that kind of pressure….myself included from time to time. There are times in life when I absolutely love to lead. I love to be a part of a group and share my thoughts and guide whenever I possibly can. There are other times when I love to follow. I love to sit back and watch the world pass me by. I love to follow to see how and why people do as they do. This allows me to find myself a little bit more…it allows me to see what I truly believe in and where my morals and values stand. interesting ideas here… I think the best leaders, lead by example. 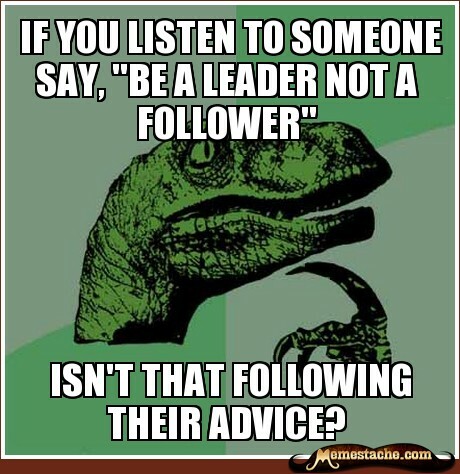 And as a follower it behooves you to always look at leaders you follow with just a bit of healthy skepticism. I liked what the poster said! …”Who talks best to others also listens best to them,” we all say. Since you asked the question, I’m both. I seem to fall into those roles naturally. Sometimes, I know what I’m doing and the role of leader sort of just of just emerges. Many times, I don’t and I hang back and learn.